Here at Homify we always make it quite clear that while modern and super current trends can be very inspiring, our own home should be built keeping the personal taste in mind. Today we will know a house that was developed based on the comfort and tranquility that the clients wanted. It is a little charm in the middle of a quiet neighborhood. The architects and professionals bring together in their portfolio a series of architectural solutions that are practical, beautiful and also affordable. By just entering the interior you can realize how architecture can contribute to a pleasant and delicate environment, which is required for having a nice and quiet family life. From the street, the house looks very discreet and charming. 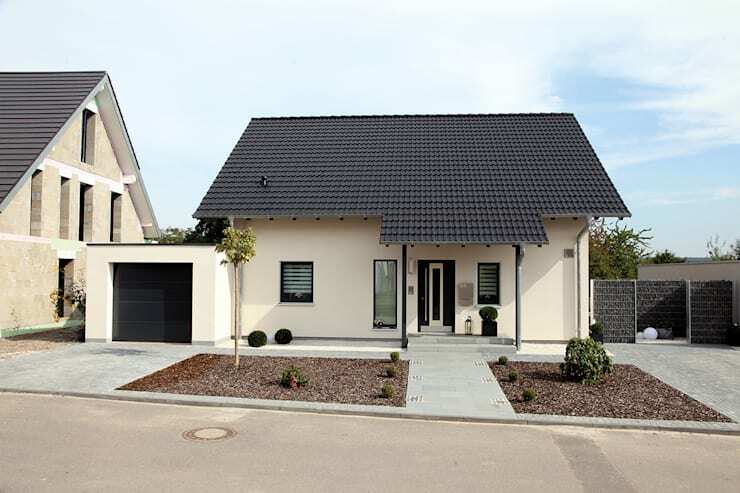 Our attention is immediately attracted by the beautiful slope of the dark roof that makes it very characteristic. The contrast of the roof with the slightly bright facade makes an exciting game. The dialogue of the two colors is repeated even in the elegant design of the main entrance door. Over the door, roof slope has been widened to create a protection up to the entrance. 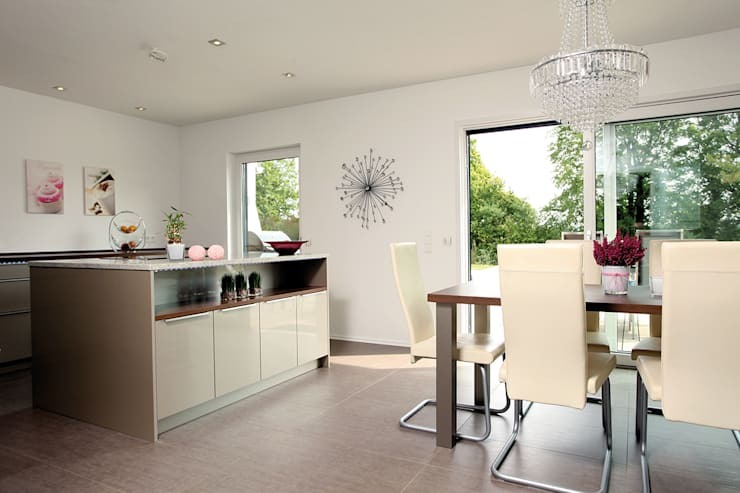 Let us now see the interior, which is dominated by white combining with various shades of cream, brown and a few other colors. The floors in earthy tone imitate wood, but it is a neutral ceramic material with uneven texture. 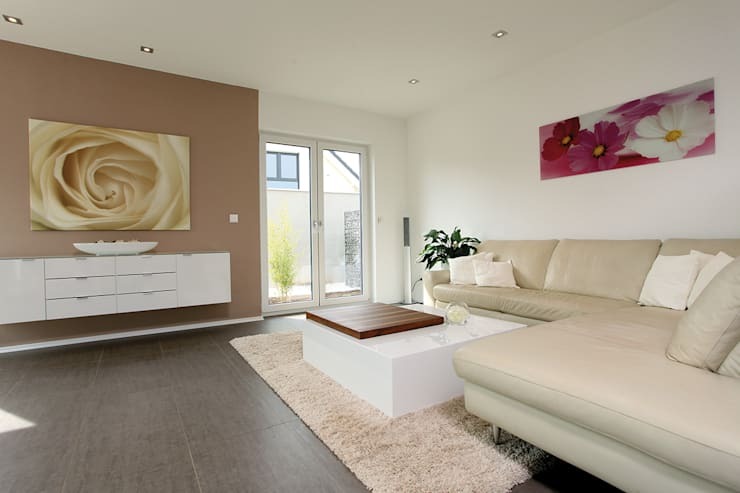 The living room has its shades contrasted with the soft carpet in a very chic style. A modern center table complements the scene and offers practical support to the delicate sofa. The environment is decorated in a contemporary style as are the other rooms of the house. Here we have already discovered that it is an open kitchen with integrated dining room, where the glass doors provide a beautiful view to the terrace. We also observe a style of modern chairs, based on steel structures lined in a comfortable, eco-friendly leather. On the table is suspended a beautiful glass chandelier, which provides a note of luxury. Also, the kitchen space is determined by a huge island. Between white walls, the wood and metal treatment of the spectacular staircase stand out. 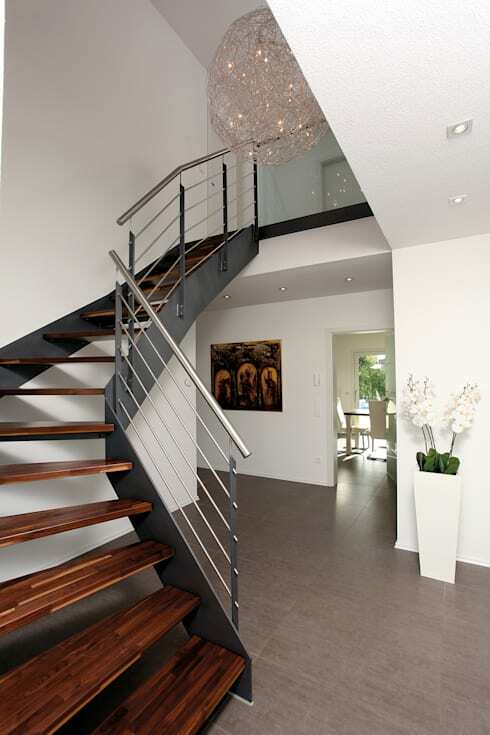 A dark metallic construction and dark wood steps form a stark contrast to the light walls and ceilings. The metal grille offers a modern design and elegance. Also, the space is vast and flooded with light. Now we will know the bathroom which is original and like a spa at home. Here there is enough room for a sauna, which is a real luxury. The room decor also reminds us of a spa resort, with its white, beige, gray, and dark brown tones. Now we know why the house is known for its merits of well being and tranquility. We now look at the garden facade which has a beautiful pool. The family can keep their health and beauty by swimming in the blue water. The space around the pool is decorated with light stones that perfectly complement the bright walls of the house. If we look at the terrace, we will also see the tiles combined with wooden panels. How are you thinking of going forward with the space in your house?